For the second consecutive month, there was an increase in Affluent investors who, when asked how they would invest in the coming month, indicated they would hold on the sidelines, according to a monthly investment preferences survey conducted by Spectrem Group. “Not invest” continued to trend upward to a three-month high of 40.80, a gain of 1.60 points and almost 2 points higher than November 2013. Stock Mutual Funds, the investment vehicle of choice, dropped two points to 30.80, a three-month low. Intention to invest in Stocks ticked downward 0.40 to 29.60, also a three-month low. Intention to invest in Cash dropped 5.2 points to 18, while Bond Mutual Funds dipped 1.60 points to 12.40, a six-month low. Both Real Estate (6 points) and Bonds (5.60) were relatively unchanged from the previous month. 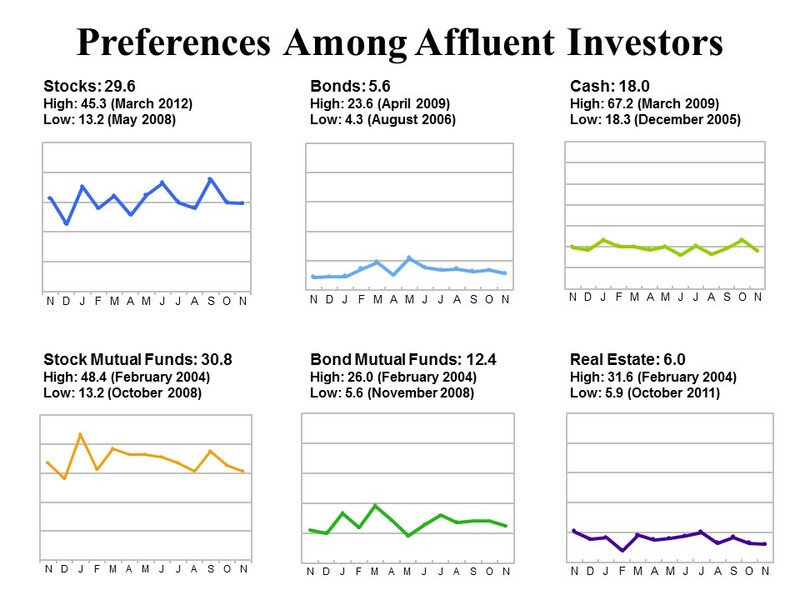 Spectrem Group breaks down Affluent investment preferences by Millionaire and non-Millionaire households. Non-Millionaires, generally more cautious investors than their wealthier counterparts, were far more likely than Millionaires to indicate they would continue to hold on the sidelines in the coming month. “Not invest” gained 5.6 points to 50.4, also a three-month high as well as four points higher than the same period a year ago. Non-Millionaires are significantly more likely to invest in Stock Mutual Funds than Stocks in the coming month though both categories saw declines—albeit slight--in the last month. Intention to invest in Stock Mutual Funds dropped 1.3 points to 28, a three-month low, while Stocks dropped 2.5 points to 21.6, a seven-month low. Intentions among non-Millionaires to invest in Cash in the coming month sagged 1.2 points to 16, also a three-month low. Bond Mutual Funds edged downward 1.8 points to 12. More Non-Millionaires than last month indicated that they would be investing in Real Estate and Bonds in the coming month. The former ticked upward 0.5 of a point to 4, while the latter gained 2.2 points to 4.8, again a three-month high. Millionaire investors intend to be more engaged in the market in the coming month, buoyed by the market’s recent record highs. The stock market closed out its fifth straight week of gains with another record high for the week ending on Nov. 21. The S&P 500 has increased 11 percent since it plummeted in mid-October. Intention by Millionaires to “Not invest” dipped 1.6 points to 31.2. For these investors, Stocks are likely to be the investment vehicle of choice. Stocks gained 2.5 points to 37.6. Stock Mutual Funds dropped 2.2 points to 33.6, a 21-month low. Cash fell 8.4 points to 20. Intention to invest in Bond Mutual Funds declined 1.4 points to 12.8, a five-month low. Fewer Millionaires than last month intend to invest in Real Estate (down 1 point to 8) and Bonds (6.4 points, down 4.1 points, a seven-month low).